Twelve million people spent nearly R2 billion at Ballito Junction Regional Mall during its first year. This iconic young shopping centre is already outperforming in its industry, market segment, and region, and has become a firm favourite in its immediate market and beyond. The 80,000sqm world-class shopping centre opened on 23 March 2017 and, since then, Ballito Junction has quickly become the darling of shoppers from the Dolphin Coast but also from Durban and beyond. The mall’s figures show that half of its shoppers come from its immediate core catchment area of Ballito and its surrounds, and over one third (34%) come to the mall from the Durban area. A breakdown of its Durban shoppers shows that while it is some 62km away from the mall, Durban itself accounts for 16% of Ballito Junction’s shopper market. Around 13% of its customer pool drive the 28kms from Verulam to the new mall. Umhlanga, which is 31kms away, represents 4% of its total shoppers. Another 12% of Ballito Junction shoppers travel even further to visit this uniquely compelling mall, coming from the Midlands, Zululand and Highway areas. All-in-all, KwaZulu-Natal shoppers make up 77% of Ballito Junction’s customers, but holidaymakers have also flocked to the new mall. Over the last year, Gauteng visitors accounted for 19% of Ballito Junction’s shoppers. With an average of nearly1 million visitors a month, its best performing month so far was December 2017 when it attracted some 1.4 million shoppers. 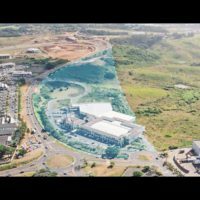 Owned and developed by investment consortium of Menlyn Maine Investment Holdings and Flanagan & Gerard Property Development & Investment, Ballito Junction Regional Mall opened during one of the toughest economic periods South Africa has seen. Despite this, the mall is showing strong trading that is growing from strength to strength. Even after a short time in its markets, Ballito Junction and several of its retailers are outperforming other, more established, comparative retail elsewhere in the region. The mall’s trading is expected to continue on its upward trajectory. Located at the heart of a burgeoning community, residential developments representing over 3,000 new homes are currently under construction or planned for development in its growing immediate catchment market. The mall represents a major private investment that benefits its community with increased economic prosperity by creating jobs and keeping retail spend local. However, it has also become very involved in other meaningful initiatives for positive community benefits.